KANSAS CITY, Mo. — Kansas City Mayor Sly James' tenure will come to an end this year. 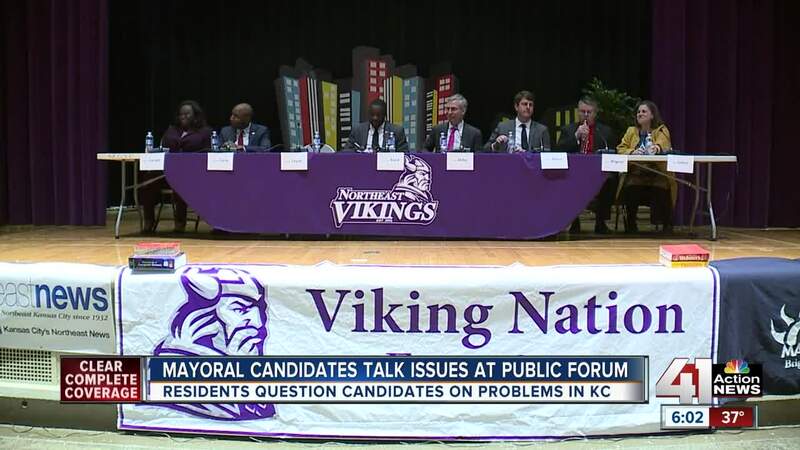 Those hoping to be his successor gathered Saturday to discuss issues facing the historic Northeast neighborhood at the first forum since the filing period ended. Eight of the 11 candidates for mayor sat on stage and answered an array of questions, ranging from homelessness to development incentives. Most of the seats weren't filled at Northeast High School, but those who attended were engaged. "This is a very good crop of candidates," resident Matthew Oates said. Reducing crime is at the top of his list of priorities in Kansas City, Missouri, moving forward. "I'd like to see a focus on community safety, so a lot of things that have been going on in the community as far as violent crime and look at ways to reduce that," Oates said. "Often, violent crime is the end of a bunch of situations and so to see how this new mayor will like to work together with different arms of the community to combat that problem." Another problem candidates were grilled about was combatting homelessness. "I am concerned about how we are going to address some of the things that are having negative impacts on our neighborhoods out here, especially the panhandling that we saw going on," resident Ingrid Burnett said. "So, what is the plan? We had an ordinance that was proposed. It was not accepted. Where do we go from here?" It's not hard to find abandoned houses throughout Northeast neighborhoods, which is something Davitte Hanson wants addressed. "A lot of trash dumping, a lot of vacant houses, and it kind of seems a little pickup is getting overlooked, so I want to know who is going to make the whole city take ownership of the entire city, not just the sections that generate revenue," Hanson said. The two-hour forum helped whittle list of viable candidates in the minds of some who attended. "I have it narrowed down to a few," Burnett said. "Being here today has encouraged me to really think about who I want to vote for," Hanson said. "I had a couple people in mind, but this has really put the icing on the cake for me." More forums are planned before an April 2 primary, which will determine the two candidates who move on to the general election in June.